We’ve all heard of Botox®, but how much do we really know about it? There’s a common misconception that Botox injections result in frozen facial expressions, but for the vast majority of Botox patients this is completely false. The overuse and/or misuse of Botox can produce undesirable results, but if the procedure is done correctly by a board certified plastic surgeon such as Dr. Houser at Cosmetic & Plastic Surgery of Columbus, it is a safe and effective way to remove wrinkles. After your Botox treatments, you will still be able have facial expressions, but because the muscle activity in the brows has been reduced, you will be able to do so without wrinkling and possibly deepening the wrinkles on the brow. So how does it work? There are two basic types of wrinkles: dynamic and static. Dynamic wrinkles are present only when the muscle is moving, whereas static wrinkles are visible whether the muscle is moving or not. When you smile, for example, wrinkles may form at the corner of the eyes and across the bridge of the nose that you wouldn’t see when your face is at rest—those are dynamic wrinkles. Botox is injected into the muscles responsible for these wrinkles, thereby preventing its development. Without treatment, those wrinkles may become permanent, or static over time. 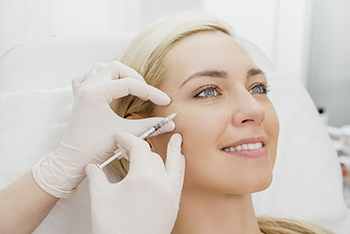 Using Botox on the muscle responsible for static wrinkles may allow the skin to smooth out over time, but it could also require other procedures such as a facelift, brow lift, or skin resurfacing with chemical peels. Though the injections themselves may be associated with some minor discomfort, they are very quick and not painful. The most common side effects occur at the injection site and are tenderness, redness and swelling. Treatment is highly effective, and most patients see improvement in a couple of days, but two or three treatments may be required to smooth the wrinkle, usually every three months. Schedule a consultation with Dr. Houser at Cosmetic & Plastic Surgery of Columbus and he can help you decide if Botox, or perhaps a different treatment, is right for you.